As Phnom Penh prepared for the return of deposed first prime minister Prince Norodom Ran­a­riddh today, diplomats and analysts warned of heightened political tensions. “We can already see it rising,” said one Western dip­lomat, referring to a large though peaceful demonstration in the city against the prince and his top military commanders Saturday. About 1,000 marchers, many admitting they were promised money to participate, held pla­cards denouncing the prince’s re­turn as they proceeded down Mo­nivong Boulevard and on to the Inde­pendence Monument. One man had no idea why he, his wife and three children were marching. “I don’t know where we’re going. It seems we’ve just been walking around Phnom Penh. We’ve been told we’ll re­ceive a donation,” he said. Prince Ranariddh is scheduled to arrive at Pochentong Airport at 12:15 pm with several ambassadors in tow, including the UN Special Representative to Cam­bodia Lakhan Mehrotra and former US congressman Steve So­larz, a press release said. Lu Laysreng, an aide to Prince Ranariddh, confirmed Sunday that everything was on schedule for the prince’s return. Thirty-four other members of the prince’s entourage will arrive on an earlier flight at 11 am, he said. Three-hundred supporters and more than 150 journalists will be on hand to greet him inside the airport, Lu Laysreng said. Thou­sands are expected to line the roadside by the airport, he said. King Samnang, chief of the Ministry of Interior committee arranging for the prince’s security, said Sunday that more than 1,000 officers will be de­ployed along Pochentong Boulevard. “We hope there will be no violence because we have guaranteed the security of the prince 100 percent,” said the Funcinpec ap­pointee. Prince Ranariddh will return to Bangkok on Thursday, Lu Lay­sreng said. 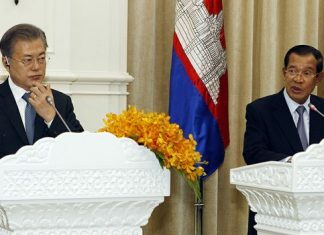 “The return of the prince is just the first step,” he said, adding that the prince will remain in Bang­kok until the entire Japanese peace plan, including a cease-fire in the northwest, is completed. Prince Ranariddh is returning under the aegis of a Japanese-sponsored peace formula aimed at ensuring that elections scheduled for July are free and fair. His return after eight months in self-exile is likely to heighten political tensions despite the intentions of the international community which is pushing the move, diplomats and analysts said. 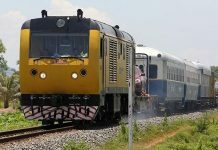 “I think it’s safe to say we’ll see this kind of thing continue, which is not always good considering the volatility of Cambodian politics,” the Western diplomat said. The international community, which supports the Japanese plan, has said it will not support or recognize the July 26 polls unless the prince is allowed to take part in the election. Many caution, however, that the mere return of the prince, who was granted a royal pardon for two convictions recorded in his absence, will not mean that the election is free and fair. 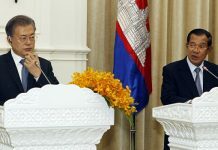 “It may even make the situation worse,” said an Asian diplomat who noted that for the past two decades increases in political activity in Cambodia, such as the one Prince Ranariddh’s return is likely to spur, have been accompanied by a rise in violence. “The lines have been drawn so rigidly that open campaigning is often seen by the other side as open war and sometimes it is,” the diplomat said. He added that even the presence of thousands of UN peacekeeping troops during the 1993 election had not been enough to prevent the murderers of more than 100 political activists. Others echoed those comments, saying that while the international community insists it is looking beyond the prince’s return at other possible problems with the polls, it may have placed too much emphasis on Prince Ranariddh’s return. The British and US Embassies have warned their citizens of possible political violence in the coming days because of the prince’s return and a planned ceremony marking the one year anniversary of the March 30 grenade attack. The US Embassy warned its citizens to avoid the area in front of the National Assembly Monday morning along with large crowds and demonstrations associated with the prince’s return.